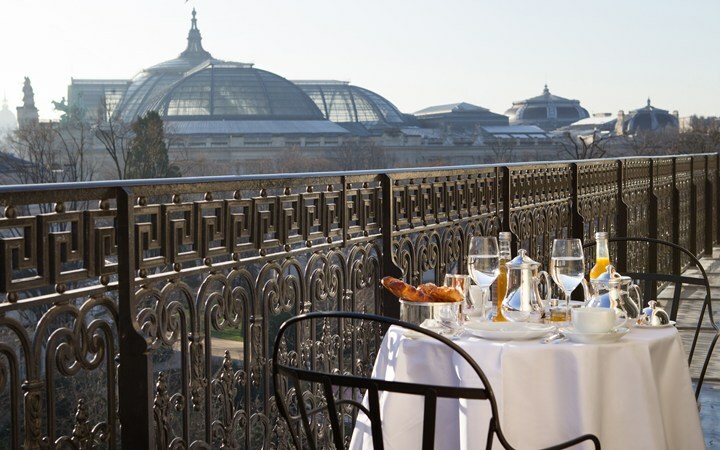 When we think about Paris’s luxury accommodation choices, we often conjure images of the city’s grand hotels, the famous and expansive palaces that feel quintessentially Parisian. For a more boutique take on refined service, visit La Réserve Hotel Paris, a chic and private mansion with just 26 suites and 14 rooms. As you enter, you feel as if you’ve walked into your personal mansion—a mansion that happens to be located in the heart of Paris, just off the Champs Elysées, just minutes from Grand Palais, with views of the Eiffel Tower. 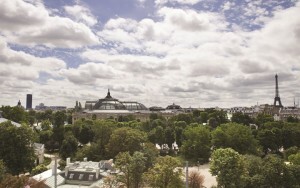 In its premium location, the hotel feels extraordinarily private, shielded by trees and surrounded by gardens. 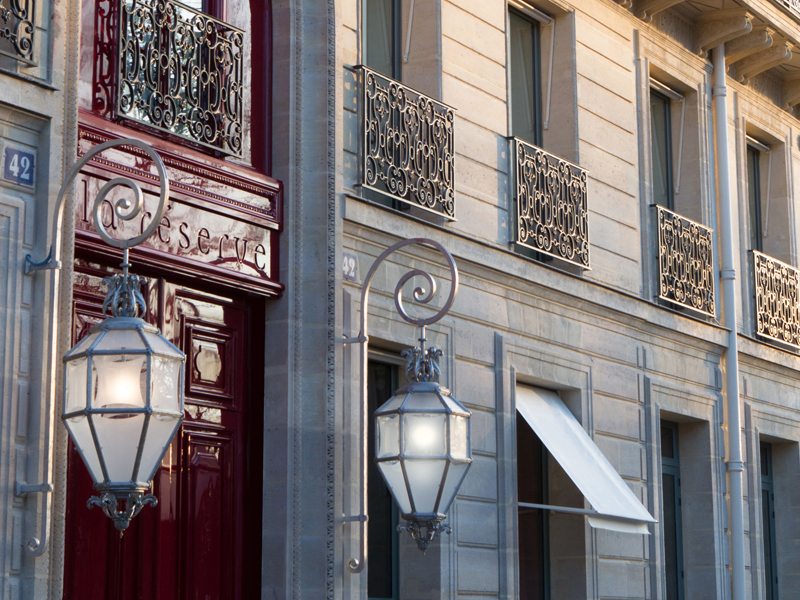 You will walk through the bold yet welcoming red doors into a pristine living space strikingly outfitted with just the right balance of 19th century Paris and modern touches. The check-in desk is intentionally discreet, determined not to take away from the atmosphere of the sitting room, abuzz with stylish visitors. Off the lobby is the restaurant Le Gabriel, which has been awarded two Michelin stars for its seasonally inspired cuisine. 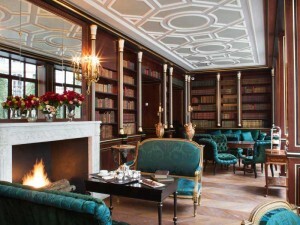 There is a private area beyond the elevators reserved just for hotel guests, where you can relax in the impressive library or indoor or outdoor smoking lounges. Adjacent to the spa is a large indoor pool, a rarity in Paris. You could easily spend an entire afternoon in front of the downstairs fireplace, enjoying a book, a glass of fine wine and little snacks from Le Bar. Highlights from the owner’s private art collection are featured throughout the hotel, and fresh flowers add to the ambiance. 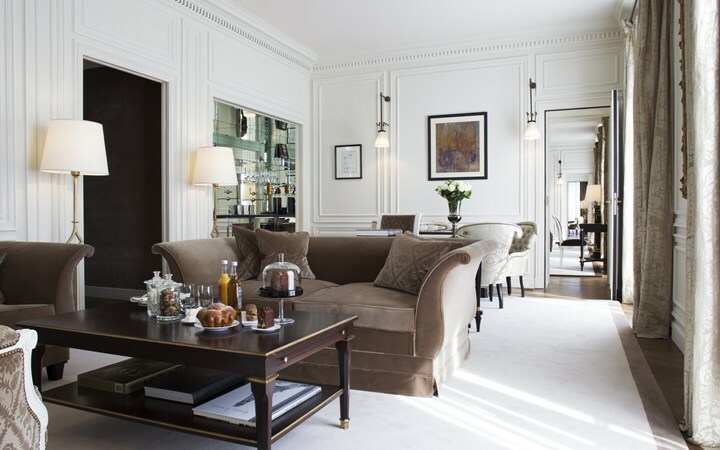 The suites are lavish and refined, with silk-clad walls and brocade upholstery. They strike that same balance between tradition and chicness that the common areas achieve but in a lighter color palette, as if to evoke relaxation. The en suite bathrooms have Carrera marble, and some feature enormous walk-in showers as well as free-standing tubs. You will feel both private and pampered, as the hotel’s team checks in continually to ensure you have everything you need. What sets the hotel apart is its meticulous attention to detail and generous approach to service. For example, every room has a complimentary minibar that is restocked daily with carafes of fine spirits, a fridge teeming with soft drinks and juices, and an expansive selection of snacks, all gratis. La Réserve’s staff is attentive and discreet and sincere in its mission to deliver personalized service. In fact, when a guest discovered he had taken the wrong luggage from the airport, and that his actual bag was 45 minutes outside of the city, the hotel sent a car to retrieve it. La Réserve Hotel truly felt like a home away from home – intimate and elegant, private and refined.